Our History | All American Foods, Inc.
November 2017: All American Foods has announced its acquisition and installation of liquid processing equipment that will enhance their ability to further develop and process the value-added ingredients they are known for. This equipment gives them the ability to offer a variety of liquid food ingredient solutions while also expanding its Pro Mix® line of dried, co-dried and dry blended ingredients. October 2016: All American Foods has announced the successful start-up of their new spray dryer located at their corporate campus in Mankato, MN. The acquisition and commissioning of this equipment will further enhance their ability to develop and process the value-added ingredients represented by their Pro Mix® product line. August 2016: All American Foods has announced the completion of their technical center expansion, located at their corporate campus in Mankato, MN. The completion of this year-long project provides a state-of-the-art facility with a diverse range of pilot plant, food prep, and test kitchen capabilities. All American Foods offers a full range of liquid and powder processing capabilities with on-site validation of ingredient functionality and processing parameters. December 2015: All American Foods, Inc. board members unanimously approved the expansion of their Research & Development and Pilot Plant facility located on their corporate campus in Mankato, MN. This new expansion will more than double the size of its current facility and allow for an increased level of product development to enhance the innovative ingredient solutions it offers to current and potential customers. January 2014: All American Foods, Inc. expands its packaging capabilities to include tote/super sack handling from both a procurement and finished product side. Our spectrum of packaging options for finished products range from 10 lbs. to 3,000 lbs. and include heat-sealed bags, bag-in-box, totes / super sacks, and more. September 2010: To continue to develop innovative ingredient solutions, All American Foods, Inc. opened a state-of-the-art Research and Development and Pilot Plant on their 14-acre corporate campus in Mankato, MN. This facility is designed to perform experimental work and continually evaluate and create new processes and ingredients. June 2006: All American Foods, Inc. acquired the assets of Forester Foods, Inc., which included its line of dairy blends that are sold primarily to frozen dessert manufacturers. The products and technical expertise associated with this acquisition helped to further expand the Pro Mix® line. 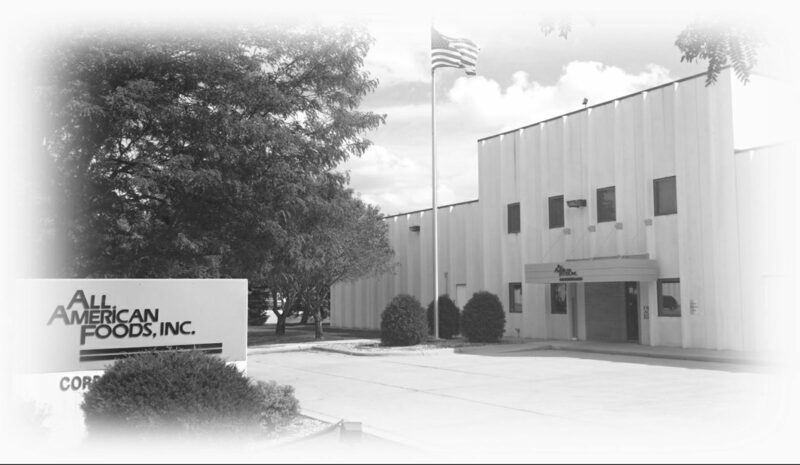 June 2004: Further processing equipment was added to our original Mohr Drive facility in Mankato, which incorporated our second automated packaging line for 30 to 60-pound bags. May 2002: Further processing equipment was added to the Waseca facility to allow for an expansion of our liquid handling and additional processing capabilities. November 2001: In a move to strengthen its position as a leading supplier of specialty ingredients and custom processing, All American Foods, Inc. announced the opening of its Technical Center located in Mankato, MN. Technical and application assistance is offered to current and potential customers from this facility. The AAFI technical center is designed to bring applications from start to finish. Utilization of this facility’s equipment, along with its close proximity to pilot plant and manufacturing facilities, adds additional support to those efforts. March 2000: All American Foods, Inc. acquired a food processing and packaging facility in Waseca, MN (formerly Waseca Foods). This facility is located on 7 acres in the southern industrial park of Waseca and includes an automated packaging line for 30 to 60-pound bags. June 1998: A neighboring building was acquired by All American Foods, Inc. for use as engineering and maintenance shop areas. April 1996: All American Foods, Inc. continued to acquire land along Mohr Drive growing the Mankato campus to approximately 14 acres. Construction then began on a third processing and packaging facility. This 28,000 square foot, full production, facility was completed in 1997 and incorporated employee training areas along with production and warehouse facilities. May 1993: All American Foods, Inc. made the decision to develop a corporate campus in Mankato to facilitate growth. After more land was acquired on Mohr Drive, construction of a second processing and packaging facility began. At this time, the use of the original 1987 start-up facility was discontinued. With an addition, early in 1995, this facility grew to approximately 28,000 square feet. June 1989: All American Foods, Inc. built a corporate office, quality assurance lab, and manufacturing facility at 121 Mohr Drive. The 15,700 square foot facility was completed and put into use in September of that year. The Industrial Road facility was then used as a pilot facility for processing and packaging. This facility grew to approximately 32,000 square feet with a 16,000 square foot addition in 1991. March 1987: All American Foods, Inc. was founded by Jeff A. Thom and operated until January 11, 1988, as a sole proprietorship. At that time, All American Foods, Inc. became and operated as a corporation under the laws of the State of Minnesota. The initial corporate location was in Mankato, on Industrial Road and consisted of 11,000 square feet.